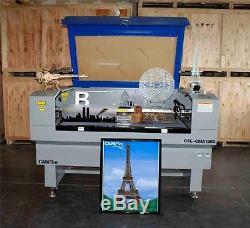 CAMFive cutting & engraving laser machine 50"x26" work table 100W PRO Laser Tube. Is an American brand, an American established corporation and a proud member of. The Specialty Graphic Imaging Association. The National business media and. The Graphic of the Americas organizations. One is located in Los Angeles, CA and the other one in Orlando, FL. OUR LASER MACHINES CAN ALSO DO 3D ENGRAVING, PLEASE ASK YOUR SALES REPRESENTATIVES FOR MORE INFORMATION. CFL-CMA4824/100W CAMFive PRO Laser Cutter and Engraver Machine. Cutter and engraving laser machines you can create and produce unlimited projects in a wide range of industries such as sign and displays making, light guides for led signs, die cutting, embroidery applications cutting, name plates, tags, trophies and awards engraving, rhinestone templates, etching on fabric and textiles, label marking, wood and acrylic cutting and etching, among others. Follow the link to watch a video of our machine cutting Skateboard tape grip. CFL-CMA4824 industrial laser cutter and engraver machine is specially designed to work 24/7. This machine is equipped with a 50"x26" honeycomb work table (48"x24" actual working area) with 49 pass through making it able to handle 4'x8' sheets, a laser head that includes a special dual cooling system, air assist, air valve and red dot pointer. One CO2 100 watts CAMFive PRO laser tube (up to 10,000 hours life spam), exhaust blower, air compressor, electronic water chiller unit and safety features like door sensors, emergency stop buttons and on/off key to prevent accidents. Laser Machine Software to control the cutting and engraving process of your work, controlling speed, power, and resolution. Capable of engraving vector and picture files directly. This software is compatible with a large variety of design programs Such as Corel Draw. Illustrator, Photoshop, Autocad, Wilcom and more and files: bmp, gif, jpg, pcx, cad, tga, tiff, plt, cdr, dmg, dxf anf dst file formats. Laser machine software, operation and installation manuals. Tool kit for preventive and corrective maintenance. Cotton fabric and mixed fibers. Fabric with thick synthetic fibers. Lycra and other synthetic fabrics. Marble, Ónyx and other stones. Rubber (Gum elastic or India rubber). Features that make our machines better. Honeycomb work table, actual workable area of 48"x 24". Recommended when you want to engrave any material or if you want to cut fabric, cardboard, paper, rubber, felt or other type of soft and thin material, also when you cut small pieces. Stripped tables with removable strips are also available for an additional charge. Re commended when cutting acrylic or wood to avoid the bounce back effect. 100 Watts CAMFive PRO CO2 Pyrex laser tube with up to 10,000 work hours life spam, it comes with controllers to ensure the highest possible work quality and resolution. The power of this tube compares to an 130W standard regular glass tube and it will give you a clean and polished edges when cutting up to 1/2" of acrylic or wood and capable of cutting up to 3/4". German design Laser Head with X-Y Axis positioning system that ensures precise work, fast and extremely accurate results. Electronically controlled Japanese motors to ensure maximum precision, reliability and performance. Very dependable and maintenance free. User friendly multilingual LCD Control Panel is incorporated as well as Potentiometers to regulate the laser output power, laser beam on/off button and keyed Security Lock-out switch. The machine comes with a USB input port for flash drives that allows you to load files into the internal memory and USB/Printer port (connection cable included) to connect it directly to a PC. Precision Laser head system includes. Laser pen with dual (water/air) cooling system to protect the lens, also provides the finest quality of work during cutting and engraving. Optional Lenses of various focal lengths can be installed depending on the type of the materials being used or the requirements of laser process being performed. The red dot pointer helps as a reference to check where the laser beam will land on to your material. By tracing a simulation of your design without activating the laser. The Air Assist System includes a compressor that helps to supply air. Clearing smoke & debris from the work area, cool and protect the Laser Head focusing lens, diminish the amount of flaming, scorching, charring from the work piece, and reduce the chances of ignition when it is working with flammable materials. An air valve to regulate the air flow is also included. This gives you the versatility to get the best quality on any material you cut or engrave. Our 50 mm focal distance lens made with German technology, optimizes laser beam allowing it to produce fine cuts or deep engravings, depending on your requirements. Also available 75 and 100 mm focal distance lenses for other applications. Additional security and safety features. Door sensors to stop the laser automatically. Our laser machines are equipped with security sensors and safety features disabling the equipment in case of inappropriate use or unsafe operational conditions. Emergency Stop Bottom gives the machine operator the ability to IMMEDIATELY and completely shut down the entire machine in case of a problem or any event. The safety turn on Key feature prevents an unauthorized use or operation of the laser machine, allowing only approved operators and/or trained personnel responsible in the operation and maintenance of the equipment. 49 inch wide rear pass through opening allows the loading of substrates as the installation of an optional feeder. The electronic water chiller helps to regulate the laser tube temperature while in operation by keeping the water under room temperature. This is a highly efficient unit that requires minimum maintains. EXHAUST BLOWER AND 12' DUCT TUBING. Various materials release small amounts of fumes and gases in the engraving or cutting process. To extract these fumes and gases, our CAMFive comes equipped with an exhaust system and 12 feet (4 meters) of flexible ventilation duct tubing to be installed when the machine is being operated inside a small and enclosed area. 3000 VA voltage regulator is provided to protect the laser machine's electrical components and sensitive electronics. The item "CAMFive cutting & engraving laser machine 50x26 work table 100W PRO Laser Tube" is in sale since Wednesday, June 22, 2016. This item is in the category "Business & Industrial\Printing & Graphic Arts\Screen & Specialty Printing\Engraving". The seller is "camfiveusa" and is located in La Puente, California. This item can be shipped to United States.